Prostanoids are a class of oxygenated lipids that provoke diverse biological actions in many tissues and cell types through interaction with nine G-protein-coupled receptors (GPCRs). The prostanoid thromboxane A2 (TXA2) is a key activator of platelet. It is crucial in the amplification and maintenance of the platelet response and in the recruitment of new platelets to the growing thrombus. Stimulated by TXA2, the human TXA2 receptor (TP) plays a pivotal role in cardiovascular homeostasis. Thus, TP is considered as an important drug target for cardiovascular disease. In the past decades, a number of TP inhibitors have been developed as drug leads. However, limited success has been made in their clinical application due to efficacy and toxicity issues. 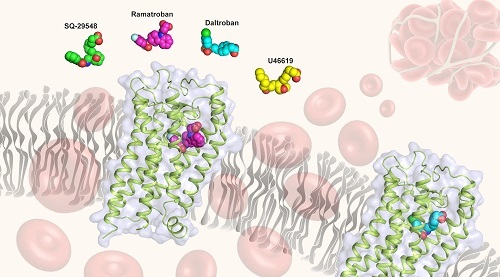 In a recent study published in Nature Chemical Biology, a research group led by Dr. WU Beili at the Shanghai Institute of Materia Medica of Chinese Academy of Sciences reported the high-resolution crystal structures of human TP bound to two non-prostanoid antagonists ramatroban and daltroban. 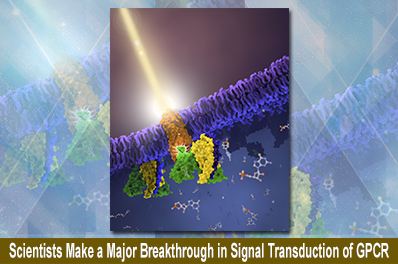 These structures revealed, for the first time, the molecular details of TP binding to its ligands at atomic level, and offer new opportunities for drug optimization and discovery targeting this physiologically important receptor. The study provided insights into the ligand binding of TP. One exciting finding was the unique arrangement of extracellular loops that differs from all the other known GPCR structures. The extracellular region of TP forms a two-layer “roof” structure constrained by two pairs of disulfide bonds. One of the disulfide bonds connects the N terminus and the extracellular tip of the third transmembrane helix of the receptor. This has not been observed in any other GPCR structures. This double-layer cover stacks on top of the ligand-binding pocket in the TP structures. It provides a suitable binding environment for the ligand, and most likely blocks the access of the ligand from the extracellular milieu. The hydrophobic endogenous ligands, and their synthetic mimics, likely enter the ligand-binding site through the lipid bilayer and transmembrane helices. The TP structures provided a detailed molecular map of interactions between TP and the two non-prostanoid antagonists, ramatroban and daltroban, which not only helps to integrate previous mutagenesis and structure-activity relationship data, but also provides an accurate template for drug design targeting TP. To further investigate the ligand-binding behavior of TP, researchers performed molecular docking of two prostanoid-like ligands into the TP structure. Based on extensive studies of mutagenesis, ligand binding and cell signaling assays, they found that the docking models suggest a prostanoid binding mode that may also be adopted by other prostanoid receptors. Besides, they revealed that the first and second transmembrane helices of the prostanoid receptors are key determinants for prostanoid ligand specificity. The findings deepened the understanding of ligand recognition and selectivity mechanisms of this important GPCR sub-family, and would enable the development of new anti-cardiovascular disease drugs with better selectivity and efficacy. The study was funded by National Key R&D Program of China, Chinese Academy of Sciences and the National Science Foundation of China. Using cryo-electron microscopy, a joint research group led by Dr. H. Eric XU, a professor from Shanghai Institute of Materia Medica.has determined the structure of a molecular complex that is responsible for regulating vital physiological function.